English Translation published in 2007 by Sort of Books. Jonna had a happy habit of waking each morning as if to a new life., which stretched before her straight through to evening, clean, untouched, rarely shadowed by yesterday's worries and mistakes. Another habit - or rather a gift, equally surprising - was her flood of unexpected and completely spontaneous ideas. Each lived and blossomed powerfully for a time until suddenly swept aside by a new impulse demanding its own undeniable space. There is something about a Tove Jansson book that leaves you quiet and contemplative. I always feel a calmness float over me when I have finished one of her books. Her stories are not fast and thrill seeking, but they hold my attention all the way through. I suppose the best way to describe the books of Tove Jansson are slow but steady, like drifting gently down a winding lazy river, allowing you to take in all the aspects of the world around you as you pass, using all your senses to feel your way along. 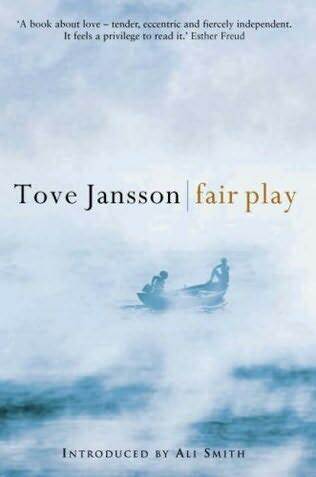 Fair Play is described as a novel and I feel I would have to disagree with this description. To me, if felt more like a collection of short stories which have fallen out of a folder and had been put back higgledy piggledy. I don't say that as a bad point, as I loved jumping from one time period to another and each story is self contained and could easily be read alone. The book follows the relationship of two women, who are life long partners and friends. The women are heading towards their mature years and are both reflective about their past and contemplative of their future. This book dwells at lot on time running out, as their lives reach their final years, which gives you a feeling of sadness as you read it. The inevitablity of death raises it's head amongst the pages of peace and tranquility. The relationship of the women has a roller coaster feel as they cope with high and lows within their friendship. The partners are very different in character to each other and have to work hard to keep every on an even keel. The two women devote their lives only to work and love and many feel that this book is quite autobiographical and portrays Jansson's relationship with Tuulikki Pietila, whom she spent 40 years with. Within the book, there are various black and white photographs featuring Jansson with Pietila, showing them during work and recreation. Each chapter is detailed and quite philosophical about life, love and work. It is rather a small book and could easily be read within one sitting. Even though it is short, the book does affect your mentality and I cannot see anyone coming away from it without a feeling of calmness. I love Tove Jansson's books for both adult and children and I was really pleased to discover that the Moomins ( Jansson's children's characters) celebrate their 65th birthday this year. Their birthday has resulted in the re release of the Moomin books, which I am eagerly waiting to get my hands on. Someone took ma-in-law a copy of this into hospital and she really enjoyed it saying it was quite uplifting and not at all demanding to read. Glad you enjoyed it as well. Quiet. Contemplative. I want to read this already. I love the cover. I've never heard of this author, but she sounds like a good one to know. What book of hers would you recommend beginning with? The book does sound interesting, but I'm not sure I'd enjoy the format. Great review! Wow, what a lovely review. I do like the sound of this author. As Alice said, 'Quiet. Contemplative' - Exactly the kind of thing I think we all need to explore in our reading every now and again. Blodeuedd - I love that Jansson is Finnish. I could definitely read more books from Finland. Petty Witter - your mother in law has good taste! Alice - you would love it. Amanda - I absolutely love the Moomin books but I wouldn't say they were for everyone. I really enjoyed True Deceiver, but that is more of a winter book, one for snuggling up by the fire. I have yet to read The Summer Book, but Ana loved it, so I would probably start with that one. That is the one I want next. Kathy - don't worry, it isn't for everyone. Ceri - it was a lovely read and very simple. I've never read any, not even the Moomins. Only seen those on TV. I'll have to rectify that as I love the sound of this. Oh I do like books like these but it sounds a bit sad? I think for something like this I definitely have to be in the right mindset to enjoy. Thank you for your lovely review, Vivienne! Your opening sentence is perfect, Vivienne. I just love the quiet gentleness of her books. I thoroughly enjoyed this review. You've delved very deeply into the subject matter. Thanks for this. Wow...love your review. I also love that book cover.